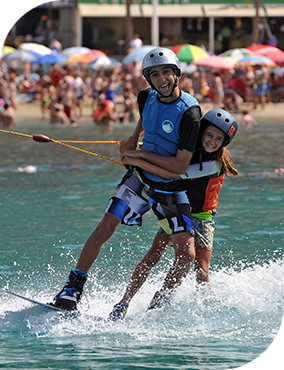 Cable Ski Benidorm is a school of waterskiing and wakeboarding for beginners and training club for competitors of all ages and modalities. It is the only cable ski in the world on the sea and the longest; having already celebrated its 50th anniversary in 2016. It was in 1966 when Humberto Armas, decided to take a risk with an unknown sports project that Bruno Rixen had patented in Germany: a circuit of 1,000 square meters of perimeter, with 4 towers joined together by a cable that allows to do water skiing without the propulsion of ship . After touring the entire Spanish coast, Humberto chose Benidorm thanks to the crystal clear waters and the microclimate of this bay; when the Avenida del Mediterráneo was still an immense field of olive trees. This is how the first Cable Ski in the world was born, which has been followed by new Cables, having already more than two hundred and fifty in the world today. His successors, Daniel Armas and Emma Segovia, have managed to maintain and renew the sports proposal to adapt to the new challenges of the sector, also advising on the business development of other Cable Skis in Spain, being Rixen Cableways consultants. Mount your cable. 50 years in a continuous change . Unlike the modality of water skiing by boat, where a specific boat is required by each skier plus 2 crew, the Ski Ski modality allows, with its mechanical towing system, to ski several simultaneously without the need of a boat, through a cable-guide located on the sea supported by towers. In the case of Benidorm Ski Cable, the longest in Spain with 1 km of travel and 4 towers, it can take up to 12 simultaneous skiers at different speeds: from 27 km / h to 58 km / h (only for professionals). Thanks to this system, the cost of sports is much cheaper; so we managed to make it accessible to all audiences. Today it is customary to receive up to 3 generations of faithful skiers who choose this sport year after year as an activity for the summer. Being a very complete sport, outdoors and at sea, it is also a way of being in shape that many local customers take as a complement to the gym. The fact that Cable Ski Benidorm is located 80 meters from the edge of the Rincón de Loix on the Levante Beach, and that on the 100 m2 of platform on the sea also has bleachers to enjoy the pirouettes of skiers and riders , turns the facilities into a meeting point of entertainment, leisure and sport in an incomparable setting that brings together more than 500 people every day in high season, with a very varied profile: families with children, couples, friends, schoolchildren of the region and from different parts of Spain and the world. In the 12 m2 stand of the beach, 30'000 passers-by are attended in four languages ​​who are interested in sports throughout the season. 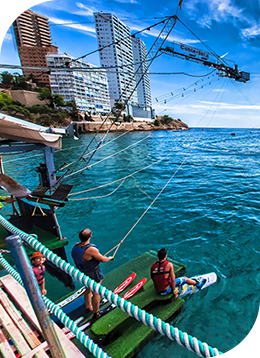 The Cable Ski of Benidorm generates sports fans, and there are more than 150 subscribers who come almost daily to train from Benidorm, Altea, Villajoyosa, Denia, Calpe ... who compete in the national and international arena. With the school and the school program, the Cable Ski becomes in July and August almost a youth camp where new promises take advantage of their summer vacation to train their favorite sport. There is no age limit, admits children from 6 years old and has some veterans that far surpass 70. Over the years, new skiing modalities have been introduced. So are the traditional two skis and the kneeboard (sitting) ideal for beginners, the mono-ski (with which the speed slalom is practiced), the figure (the classic of pirouettes), and towards the year 1996 the Wakeboard: a board similar to snowboarding in the snow, the last shout for ramp jumps, tricks in sliders and other striking maneuvers. In the first section of the circuit is the slalom field; who practice especially the "monkeys" at speeds between 37 and 58 kilometers per hour. In the fourth section of the circuit are the modules in which the federated subscribers of wakeboard or wakeskate jump. Between each section there is a 90º curve (four in total) that are one of the challenges for beginners; since, if they do not take this curve well, there is a variation in the tension of the rope that will make them lose their balance. In any case, the skier who falls more than 100 meters from the platform, is picked up by the cable boats, which can wait comfortably in the floating rafts located throughout the circuit. Depending on the time available, the pace with which you want to learn the sport, and the skier's level of knowledge, we have different ticket options. All include vest, helmet, skis and theoretical class. Ski and Wake Courses: ideal to get started in sports. Courses are offered from one hour to test the sensations and balance in the water with skis or Wakeboard, up to two, three or five days. There is also the possibility of taking the month course where you practice three days a week. Usually used by locals or tourists of medium or long stay. Time tickets : from one hour to a full day, both for those who know and for those who do not, with no limit of attempts. They are usually used by tourists on short trips or short stays with a busy schedule. Day-pass pro: for wakeboarding skiers who want the best material and take advantage of a full day flat rate. Tickets of departures or laps: from 4 to 200 laps, to be consumed throughout the season, ideal for customers who repeat and who like to go at their own pace. Special bonuses: for affiliates, federated members and school children who come almost daily throughout the season. We have equipment for all skiers in terms of vests, helmets, skis and other boards in different sizes. For the most amateurs, we have a store in which to buy the complete equipment for all ages, sizes and modalities. All ticket options include theoretical class, vest, two skis, kneeboard, helmet, and pickup with the boat. The rest of modalities are subject to rent. 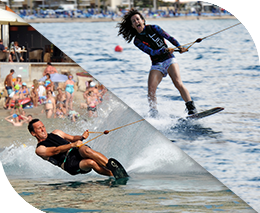 With 50 years of history and more than 3 million kilometers of nautical skiing, the Cable Ski Club Benidorm is one of the oldest, with 3 generations of skiers that repeat every year and with which we organize events and championships every summer. The quarry of this club attracts each new season to hundreds of schoolchildren and adults who come to this sport, many of which end up being champions of Spain and even of Europe.